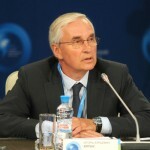 Global Policy Forum:The Modern State in the Age of Social Diversity was held on September 7-8, 2011, in Yaroslavl. The organizers of Global Policy Forum are the Institute for Public Planning, Institute of Contemporary Development and Yaroslavl Demidov State University. President of the Russian Federation Dmitry Medvedev and President of Turkey Abdullah Gül delivered addresses on September 8, 2011 at the Global Policy Forum. At the Global Policy Forum in Yaroslavl, INSOR Management Board Chairman Igor Yurgens presented the Institute’s report Collective Security Treaty Organization: Responsible Security. A synopsis of the report in English can be viewed here. The full Russian version can be downloaded here. The Institute of Contemporary Development hosted the annual investment forum Innovation for Business, which was organized by Marchmont Capital Partners with support from the Russo-British Chamber of Commerce. Over the course of two days Russian and international business leaders as well as representatives of public and academic organizations discussed issues related to the development of the market for high technology in Russia, the commercialization of ideas and creation of innovation infrastructure. The results of a foresight competition were announced on June 28 in Moscow. The organizers of the competition which was launched in November 2010 were Moscow State University of Technology and Management, Moscow Municipal Psychology and Sociology University, the Institute of Contemporary Development, the International Futures Research Academy and the All-Russian Znanie Society. The competition had three categories in which individuals up to 35 years of age could compete: 1) Best application of foresight instruments, 2) Best commentary on foresight work, and 3) Best original use of foresight methods. The VIII Tver Social-Economic Forum “Information Society” was held June 30 – July 1, organized by the Association of Managers and the Institute of Contemporary Development. Expert support was provided by the Institute of the Information Society (IIS) and financial support was provided by the Executive Office of the President of the Russian Federation and the Administration of the Tver Region. This forum is held each year and is traditionally dedicated to issues concerning the current situation in the information society and prospects for its development. Igor Yurgens, Management Board Chairman of the Institute for Contemporary Development, spoke on the prospects for Russian modernization at an EU-Russia Centre breakfast on 29 June. Yurgens said that all major players in Russia recognized the imperative of modernization. The debate was more about the speed and nature of modernization. There was a conservative camp emphasizing stability and a more progressive camp emphasizing reform. 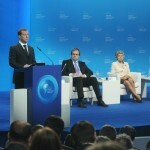 Medvedev was convinced of the need for a comprehensive modernization covering all aspects of Russian society. Without political freedom it would be impossible to reform successfully. On June 22, the Institute of Contemporary Development held a roundtable titled Acquiring the Future: Strategy 2012 – Social and Labor Relations. The event was organized together with the Friedrich Ebert Foundation. Participants of the roundtable included representatives of unions, employer associations, expert and academics working in the field of labor relations from both Russia and Germany. The discussion touched upon such issues as the Russian and German labor markets, labor legislation of both countries and public dialog on labor relations. As world experience has shown, transparency in government implies not only the access of information for citizens but also the efficacy of the instruments of access and the quality of the information itself. And this is particularly true in relation to issues concerning the expenditure of state funds. In 2010 the Institute of Contemporary Development initiated a project called RosGosZatraty (Russian State Expenditures – rosspending.ru), the aim of which is to provide transparency and accountability of state bodies with regard to all types of state expenditures – state orders, contracts and grants. Today this project includes all information about purchases from 2007 to 2010 and work is underway to enter data for 2011. The Institute of Contemporary Development held an expert discussion of the main areas of the World Bank Group’s Country Partnership Strategy (CPS) for the Russian Federation. The CPS for Russia lays out the main areas of cooperation and the aims of this cooperation between the Russian government and the World Bank Group for 2012-2015. Zeljko Bogetic, Lead Economist of the World Bank Group for Russia, gave a presentation on The Partnership Strategy of the Russian Federation and World Bank for 2012-2015 in which he indicated the partnership strategy with Russia, instruments for it implementation and possible areas for cooperation. The Institute of Contemporary Development hosted a meeting of the Russian-US High Level Group, which was created by the Institute and the US Council on Foreign Relations (CFR). The joint coordinators of the group are INSOR Chairman Igor Yurgens and CFR President Richard Haas. On June 6 and June 7 the group met with Russian Foreign Minister Sergei Lavrov, Russian Presidential Aide Sergei Prikhodko and First Deputy Secretary of the Russian Security Council Vladimir Bulavin, among others.